Panicum polystachion L., Pennisetum atrichum Stapf & C. E. Hubb. Mission grass (Pennisetum polystachion) is an annual or perennial grass, with culms up to 2 m high. Panicles are 10-25 cm long and 1.5-3 cm in diameter. Caryopses are 1.7-2 mm long (FAO, 2009). Pennisetum polystachion is native to India and tropical Africa and naturalized in tropical Asia, Southern USA, Australia, Micronesia, Melanesia, Polynesia and Hawaii. It is widespread between 23°N and 23°S. Pennisetum polystachion thrives in difficult conditions and is adaptable. It prefers high rainfall but tolerates short drought periods. It is adapted to a wide range of soils from light sandy to waterlogged clay soil. Mission grass can grow under 80% shade and on poor fertility soils. In India, total annual yield was around 3.4 t green fodder/ha/year (Narayanan et al., 1972 cited by FAO, 2009), and in Fiji, 7.3 to 13.8 t green fodder/ha/year (Partridge, 1979). 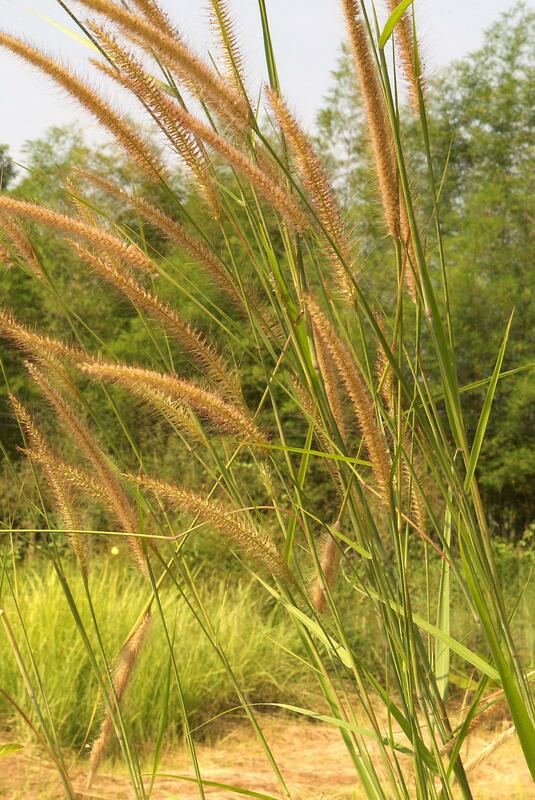 Pennisetum polystachion is resistant to fires. It is useful for controlling erosion on hillsides. It does not require fertilizers. Where it was introduced it tended to develop rapidly and can be now considered a noxious weed. This is the case in the USA (USDA, 2009), in Australia, Fiji and Thailand (Parsons et al., 2001). Overgrazing can be a way to control its development (Ellison et al., 1973 cited by FAO, 2009). Pennisetum polystachion is free of HCN (Mishra et al., 1996). Mission grass is a valuable fodder, either grazed or cut to be used as hay by cattle. Its nutritive value and palatability is high before seedling and drops dramatically after it; it is thus recommended to prevent flowering by 6-week cutting intervals. It cannot stand heavy grazing, which results in pastures being invaded by other species. 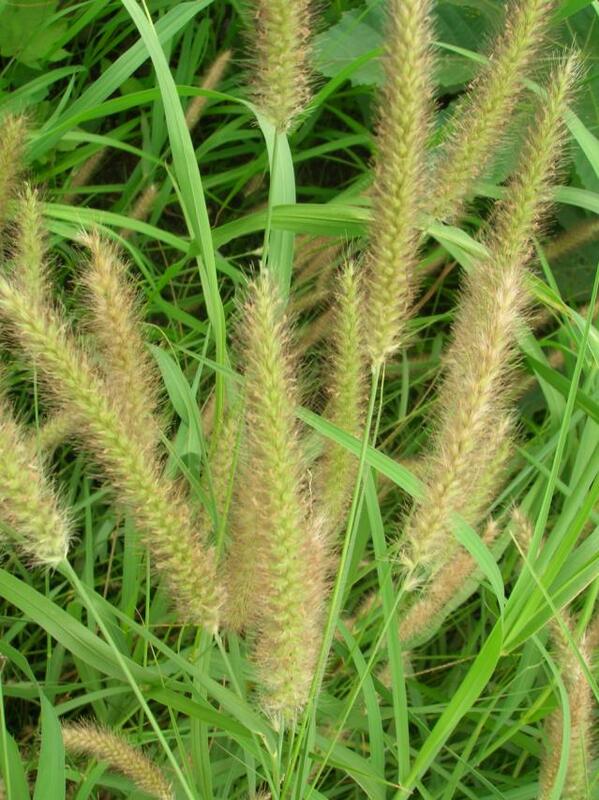 In Benin, pastures containing Pennisetum polystachion and Andropogon gayanus had a carrying capacity of 0.16 tropical livestock units/ha (Agonyissa et al., 1998). 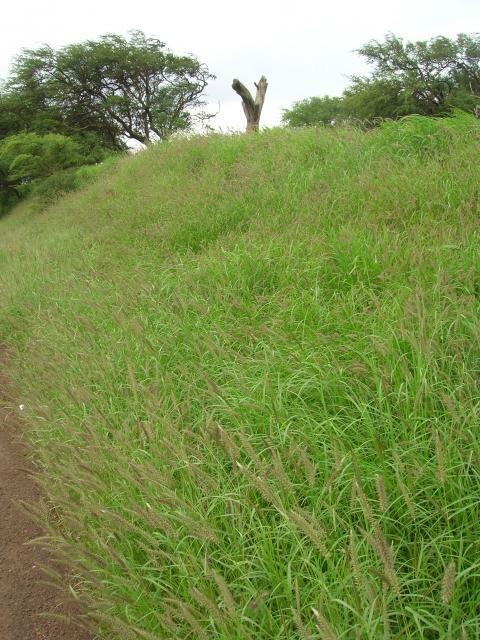 In the Fiji Islands, mission grass oversown with Macroptilium atropurpureum and Stylosanthes guianensis induced an average annual live-weight gain/head of 94 kg in steers if unfertilized, but after a heavy application of fertilizer this increased to an average live-weight gain of 143 kg/head. Marginal live-weight gain at the highest level of fertilizer is interesting only if the stocking rate is over 2 steers/ha (Partridge, 1986). Narayanan, T. R. ; Dabadghao, P. M., 1972. Forage crops for India. New Delhi, Indian Council of Agric. Res.